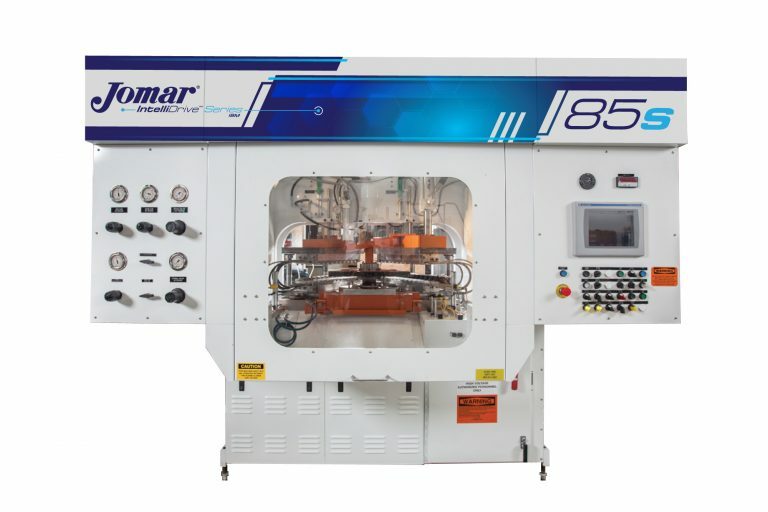 EGG HARBOR TOWNSHIP, N.J., July 26, 2016 – Jomar Corp., a leading global manufacturer of injection blow molding (IBM) machinery for the pharmaceutical, healthcare, personal care, beauty, food and beverage, and household products industries, has announced the launch of a next-generation injection blow molding (IBM) machine series that incorporates a unique custom-designed servo-driven hydraulic system. The new Jomar IntelliDriveTM Series delivers major improvements in energy consumption, output, and performance while also maintaining the machine’s footprint. The company will showcase the new IBM technology at the K 2016 exhibition (Hall 14/A32), which runs Oct. 19-26 in Düsseldorf, Germany. The Jomar IntelliDrive series features precise servo-driven hydraulics that reduces energy consumption by 40%-50% and boasts a dry cycle time of 1.8 sec. which is significantly faster than standard hydraulic machines. Jomar engineers worked in partnership with Bosch Rexroth, Charlotte, N.C., to develop a proprietary use of servo-driven hydraulic technology to power the plastifier. Along with the lower energy and utility costs, the IntelliDrive series offers a reinforced main platen which reduces the possibility of deflection. The machine also features a closed-loop system for the machine’s clamping system, which delivers exact control over the clamp’s speed and position. This creates faster speeds for opening and closing while simultaneously reducing impact upon tooling, thus prolonging the lifespan of the molds. Overall, the IntelliDrive series has a higher degree of control over the machine’s internal functions, resulting in more efficient use of energy. As a result, in addition to the power savings, the machine requires 40% less hydraulic oil, uses less than half the cooling tower water, and emits substantially less ambient heat compared to standard hydraulic machines. These factors all dramatically reduce overall operating cost. “Over the last couple of years, we’ve had numerous inquiries about our intentions in developing an all-electric machine,” said Carlos Castro, President of Jomar. “The IntelliDrive Series is a preferable alternative for Jomar because we’ve achieved energy savings comparable to all-electric machines while also maintaining our robust and versatile hydraulic system.” Energy savings is contingent upon machine model, container specification, and material process. The hydraulic system of the IntelliDrive series vastly improves the machine’s energy efficiency and control, but doesn’t require costly components that could amount to as much as 15% of the entire machine. In fact, the IntelliDrive line of machines will only cost 10%-15% more than the standard hydraulic machine and replacement parts will be available at costs comparable to their entirely-hydraulic counterpart. Other key features include a quick-change mounting system for the preform cylinder which drastically reduces the time required for cylinder maintenance, a digital displacement transducer for better clamp control and speed, and a variable-frequency drive for a secondary motor. The new feature-enhanced IntelliDrive IBM machine has the same footprint as its standard hydraulic counterpart. # # # About Jomar Corp. Jomar Corp. is a leading global manufacturer of injection blow molding (IBM) machinery for the pharmaceutical, health care, personal care, beauty, food, beverage, and household products industries. The company was incorporated in 1968 by Joseph Johnson and his wife Mary, thus the name Jomar. Joe was a design engineer for Wheaton Industries and was responsible for their injection blow molding department. Joe eventually left Wheaton, improved the machine and started Jomar. The company he founded built the first commercially-viable, completely integrated injection blow molding machines available to the plastic industry. In 1978, Jomar was purchased by Inductotherm Industries of Rancocas, N.J., a privately-held company now known as Indel Inc. which has built more than half of the induction furnaces in the world. Today, Jomar is headquartered in a 42,000-sq-ft facility in southern New Jersey and has sold over 2000 machines worldwide, more than half of the IBM machines in use throughout the world. Some of the world’s most recognized brands such as Gerber’s, Crayola, Merck, P&G, Unilever, Avon, and Goya have chosen Jomar for their packaging needs. For more information, visit info@jomarcorp.com.